Pre-workouts are great supplements which can help to improve your performance, motivation and energy whilst working out. Some help to set new personal bests, whereas others are better on the endurance side. We’re testing and reviewing the top pre-workout supplements to find the best for 2019. Our reviewers have tried N.O. 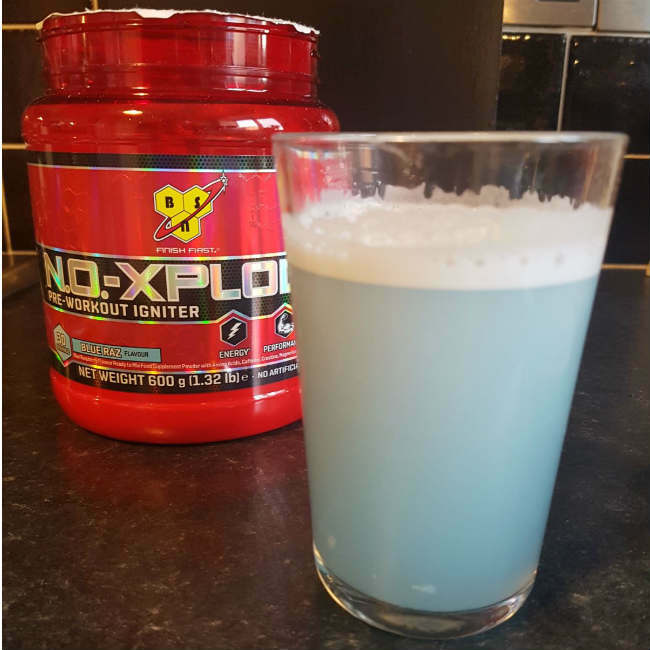 Xplode Pre-Workout Igniter by BSN in the blue raspberry flavour. They have taken the supplement before their gym session and recorded their experiences and opinions to give you a reliable and trustworthy N.O. Xplode pre-workout review. BSN’s N.O. Xplode claims to deliver intense focus, enhanced endurance, improved concentration and increased alertness. It states it is a preworkout for all athletes and describes itself as a concentrated formula designed to push your performance. This pre-workout has high expectations. But does it really do all these things? 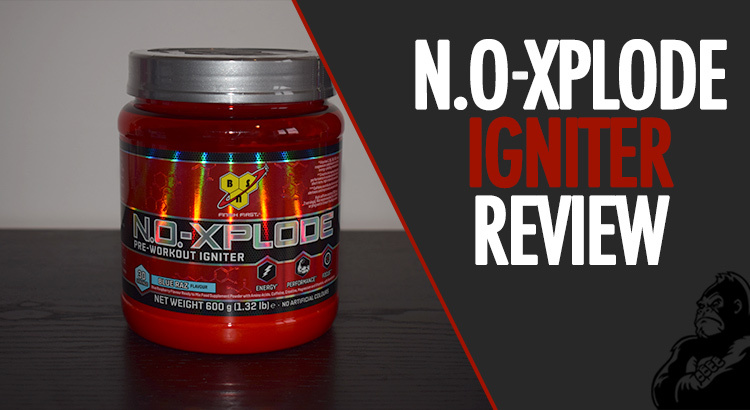 Let’s find out what was experienced in this Xplode Igniter pre-workout review. Just so you know how we’ve compiled this review, we are three different independent and unbiased testers. Along the way you’ll see different quotes from our different testers and our overall score is a combination of our ratings. We’ll give you a hint – we like this one! Personally speaking, N.O. Xplode was one of the best pre-workouts that I’ve tried so far. It just kept giving. It ticked all the boxes and I had a great workout with it. It was easy enough to drink, my energy levels were great, my focus and motivation were the best they’ve been, but ultimately, it delivered results in the gym. As I said previously, I’d say that this is the best workout I’ve used, it worked perfectly for me and I’d definitely recommend it to anyone looking to try pre-workouts, and also to anyone who is using a different pre-workout. In fact, we all rated the N.O. Xplode highly, it definitely met its expectations. We all noticed increased energy and alertness, and all pushed ourselves during our individual workouts. We all agreed that endurance levels were enhanced and and were motivated and more focused. If taste doesn’t matter to you, then this pre-workout is the one for you. “I’d be more than happy to add the N.O Xplode to my gym diet routing and use this pre-workout before every session in the gym. I highly recommend giving it a try” – Jasmin, female reviewer, 5’2″, 125lbs. This supplement seems to be the one that can certainly help you reach your goals and push your performance to the next level. Another great thing about N.O. Xplode is the price. It is available in 1kg or 600g tubs, with the 600g coming in as the third cheapest ​pre-workout that we’ve tried. For the performance offered, this is such a well priced pre-workout. Check the latest N.O. Xplode price on Amazon. This preworkout was probably one of the best I’ve tried, in terms of the energy boost. It was noticeable and consistent throughout my workout. There was no crash and energy levels were higher for the full duration of the workout and I felt I still had the energy boost after my workout. With this in mind, I probably wouldn’t recommend drinking this in the evening because you might not sleep very well. The energy boost works nicely with motivation and increased focus. I was so ready and motivated for my workout. “The difference in energy levels when working out without a pre-workout and with the N.O. Xplode was instantly noticeable. The workouts with N.O. Xplode were probably at the highest level of effort of all the tests so far. I was willing to push myself more and try a lot harder than normal. This one is very close to full marks for me.” – Jordan, male reviewer, 5’8″, 155bs. During the workout, my focus and motivation levels were notably higher than usual after I’d taken the N.O. Xplode pre-workout. I pushed to new personal records in some areas and managed to get extra reps out, whereas normally I wouldn’t be able to. My endurance and stamina were enhanced in all areas, especially when doing my cardio and HIIT sessions. It felt like there was nothing stopping me. I was so determined to push myself and reach my goals. I found that the N.O. Xplode mixed really well, just by stirring for a minute or so. The texture was completely smooth with no residue or lumps. It didn’t require thorough or aggressive stirring like some of the other pre-workouts I’ve tried. The taste wasn’t too bad, I’ve had worse tasting preworkouts. The blue raspberry wasn’t overpowering, but also wasn’t particularly enjoyable. Taste, in my opinion, isn’t a priority when it comes to pre workout supplements. It was drinkable which is all that counts. So, it doesn’t bother me when they don’t taste nice. We all said that this was the smoothest pre-workout powder we’ve tested. One tester said it was perfectly smooth, but did have a bit of an alcoholic taste to it. BSN have changed the formula from their old recipe and the taste has improved, but it still isn’t particularly ‘nice’. We think if it wasn’t for the taste this one would be scoring 5/5. The only side effect I experienced from this supplement, was a tingling feeling my hands. This is completely normal and is a temporary side effect from the beta-alanine. I actually like this feeling, it helps me to understand when the pre-workout has kicked in. The N.O. Xplode supplement is 100% a very good pre-workout and we’d all be happy to buy and use it on a regular basis as our go-to pre-workout. If you’re not bothered about taste, it’s pretty much a perfect pre-workout. The energy levels are high, endurance is noticeable and you get a great pump following your workout.